BAM 2018 was a loop tour beginning and ending in Hoyt Lakes, Minnesota. Host communities along the way included Chisholm, Grand Rapids, and Hibbing. Minnesota’s Iron Range offered incredible scenery, unique mining history, and much to explore. Each day cyclists rode 60 to 70 miles on paved roadways as well as the undulating Mesabi Trail. Wednesday, August 8. Riders signed in Wednesday night and were greeted by Hoyt Lakes local volunteers with loads of information about places to eat and things to do including the many paved hiking and biking trails, pontoon rides, fishing options, canoeing or kayaking on Whitewater or Colby Lake, swimming at Birch Cove Beach, and much more. Thursday, August 9. Day 1. Hoyt Lakes to Chisholm. Our first day of cycling headed to Chisholm, where we camped on the grounds of the Minnesota Museum of Mining, which has preserved the history of the iron mining industry in Minnesota. Chisholm is home to the Minnesota Discovery Center, where many boarded a trolley for a guided tour of a former mining location. Friday, August 10. Day 2. Chisholm to Grand Rapids. We headed out of Chisholm along the Bridge of Peace, dedicated in 1976 with flags from each of the 50 states along one side of the bridge and all the flags of the countries belonging to the United Nations on the other side. We explored the Mesabi Trail, Hibbing (where we cycled past the Greyhound Bus Museum, Bob Dylan Drive and Dylan’s childhood home, and Hibbing High School), Nashwauk (where there is a mine overlook), and beautiful rolling roads. Once in Grand Rapids, many riders headed to the Forest History Center for guided tours. Saturday, August 11. Day 3. Grand Rapids to Hibbing. We started Day 3 at the Judy Garland Museum for breakfast! 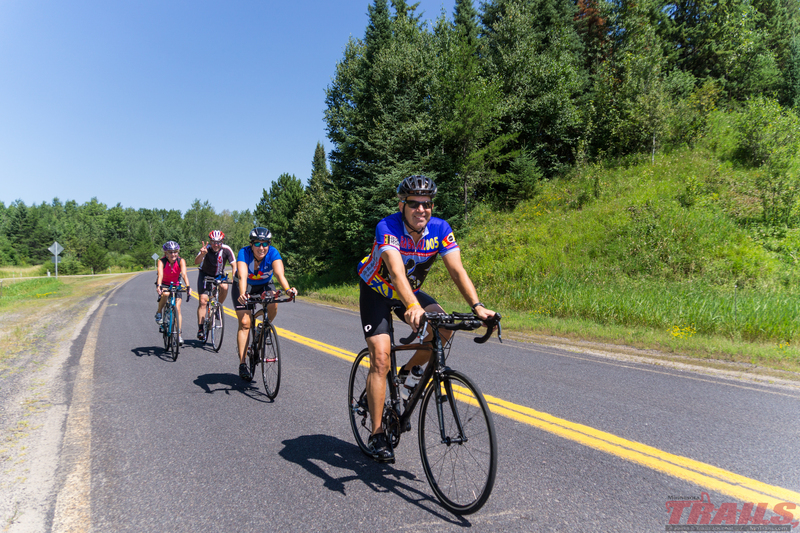 With the choice of cycling 55 or 100 miles, bikers peddled their way to Hibbing. Along the way we stopped at Blackberry for the 34th Annual Threshing and Antique Farm Show. Sunday, August 12. Day 4. Hibbing to Hoyt Lakes. BAM’s final day headed east back to Hoyt Lakes via the Mesabi Trail and county roads. Eveleth was a great stop along the route to take in how popular the sport of hockey to Minnesota. Then we moved on down the road to Hoyt Lakes, where local volunteers offered us cold root beer floats, helped us get our bags to our cars, and entertained us. All-in-all, the weather was perfect, the roads and trails were great, and BAM 2018 was amazing! Thank you to Pork Belly Ventures, who provided showers, clean towels, mobile phone chargers, and fresh Dunkin’ Donuts coffee at the campsite for all riders each morning. Thank you to Penn Cycle (and Andrew and Jon) for providing mechanical assistance to riders on the tour. They do a great job, are fun guys, and keep us moving on two wheels!